A Russian Proton rocket launched from the Baikonur Cosmodrome carrying SES 6 spacecraft on June 3, 2013. Taking an exceptionally long climb into exceptionally high orbit, a Russian Proton rocket launched from the Baikonur Cosmodrome Monday on a 15-hour flight that successfully deployed a commercial communications satellite. Liftoff of the 1.5-million-pound vehicle came at 0918:31 GMT (5:18:31 a.m. EDT) carrying the SES 6 spacecraft nestled atop the 191-foot-tall rocket. 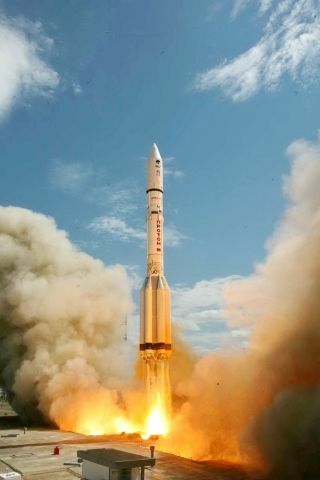 The flight was managed by International Launch Services, the Proton's chief marketer to commercial satellite companies. It was the 81st ILS Proton dating back the past 17 years, the fourth just this year and the 22nd launch carrying an SES payload. The lower three stages of the Khrunichev-built Proton stages performed as planned, leaving the combined upper stage and the 13,450-pound payload on a suborbital trajectory. Within 16 minutes of liftoff, the Breeze M had finished conducting its first firing to achieve a temporary parking orbit around Earth at an altitude of approximately 107 miles, inclined 51.5 degrees. The next Breeze burn about two hours into the mission lasted nearly 20 minutes to raise one side of the orbit to nearly 3,730 miles. A pair of firings, separated briefly by jettisoning the now-emptied donut-shaped auxiliary fuel tank from the stage, occurred four-and-a-half hours after launch to further raise the apogee to a supersynchronous height of 40,415 miles. Then began a 9-hour coast through space before a fifth and final boost was delivered to raise the orbit's low point and reduce the inclination before deploying the SES spacecraft into an orbit with a targeted apogee of 40,390 miles, perigee of 2,785 miles and inclination of 26.3 degrees. Spacecraft separation came at 0049 GMT (8:49 p.m. EDT), some 15 hours and 31 minutes after liftoff. SES 6 will rely upon its onboard propulsion to reach a circular geostationary orbit 22,300 miles above the planet where it can match Earth's rotation and appear fixed along the equator. The supersynchronous altitude will allow the orbital maneuvering to consume less fuel. Built by Astrium for operator SES of Luxembourg, the satellite will be used to replace the aging NSS 806 spacecraft at 40.5 degrees West longitude. Originally launched by an Atlas 2AS rocket in February 1998 under the name Intelsat 806, this particular satellite is being targeted for replacement by SES 6 to significantly expand capacity over North America, Latin America and the Caribbean, Europe and Atlantic Ocean region. The craft's C-band package adds high-power capacity to cable TV distributors in Americas and Europe to relay more channels. The Ku-band transponders will be used for direct-to-home services and digital growth across Latin America for Spanish and Portuguese speaking customers. The payload also supports aeronautical and maritime mobility services over the Atlantic. "With this launch we are able to fulfill demand in Latin America and the Caribbean, where we are seeing rapid growth. We will also be able to provide uninterrupted coverage for our customers in the Americas and Europe," said Romain Bausch, SES CEO. "Our long-standing relationship with ILS and Khrunichev should be attributed to their flexibility, their robust vehicle and their stout determination. We look forward to our continued partnership and future launches." SES 6 becomes the 53rd satellite in the global SES fleet.